The life story of notorious prohibition era gangster Al Capone has been a source of fear and fascination for generations. Capone’s gregarious personality and charitable giving earned him the reputation of an American Robin Hood, a man bending the rules for the ordinary people trapped within an unjust system. However, his ruthlessness and association with brutal acts of violence are enough to make the blood run cold. And after the infamous Saint Valentine’s Day Massacre, Capone became known as ‘Public Enemy No. 1’. Often nicknamed ‘Scarface’, Capone’s mannerisms, tilted fedora and turn of phrase continue to influence popular culture to this day, shaping how we perceive the quintessential gangster. From Scarface to The Godfather, Capone has made a considerable imprint on American literary and cinematic history and its depiction of charming yet brutal mobsters. Now Tom Hardy is all set to portray Capone from a slightly more vulnerable angle, in a film depicting the hardened mob boss in his declining years. Fonzo will track the final year of Capone’s life, with the once imposing man suffering from dementia following his imprisonment in Alcatraz. 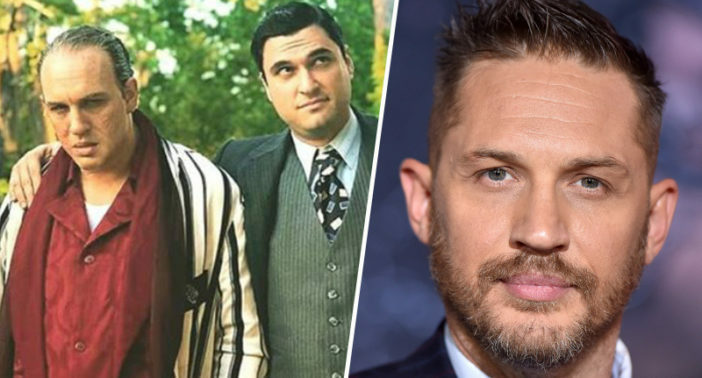 Director and writer Joshua Trank has now shared three pics from the set of Fonzo, two of which show Hardy channeling Capone with a crackling sense of menace. In one black and white still, the resemblance is uncanny, with Hardy capturing Capone’s dark gaze; fat cigar protruding from the side of his lips. With a score from Run The Jewels, Linda Cardellini (Green Book) will play Capone’s wife Mae Capone, alongside Matt Dillon and Noel Fisher. A UK release date for Fonzo has yet to be announced.